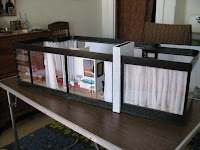 Mini Modern: Things To Do: Befriend Kathy and Steal Her Glass Dollhouse! Things To Do: Befriend Kathy and Steal Her Glass Dollhouse! 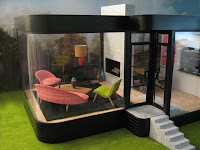 Have you seen this glass dollhouse? Whoa! Que chulada de casita. Me e enamorado de ella. My Spanish is horrific but I believe you are saying that the little house is great and you are in love with it. In the great words of my oldest child "Me too! Me too!" That's a gorgeous house. Alas, I'm in the market for my first house (which I suspect, to my dear husband's chagrin, will be followed by a second and third), and I think I need an easily dissassembled model . . .
Love the style, its rather unusual. Also like the "modern" retro style furniture. I'm not into the Victornian era dh. Was just going to make a house in my own style (vicarious living). Now through your blog and others, I might have to get "modern" designed items in both.